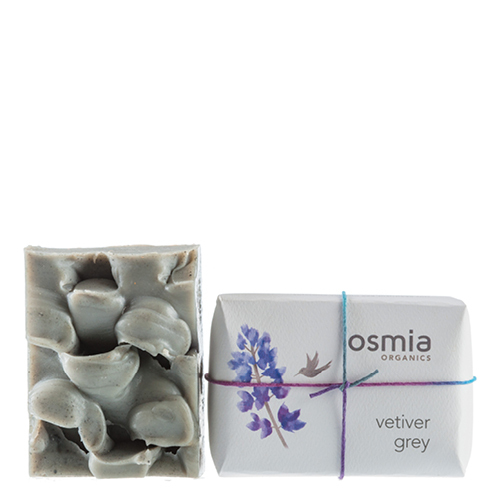 Vetiver Grey Soap by Osmia contains three powerful ingredients to make skin feel super detoxed: dead sea mud, black clay and castor seed oil, which offer a purified and softened feel to skin. Each soap is cured for six weeks as part of Osmia’s artful soap-making process, making it a long-lasting shower essential. With the scent of grounding vetiver, you can turn a simple shower into a few moments of meditation. Apply daily as needed. Using a loofah or natural towel, apply liberally to create a luxurious lather. Can be applied to both body, feet and hands (not the face). To extend life of soap store on a soap saver away from excess water. This is my favorite osmia soap but NOT my favorite scent. This bar lathers up the most, and lasts the longest in my experience. I prefer the scent of something more woodsy, less vetiver but I take the effect over the smell here. I find the other osmia bar soaps to not last as long or lather as well as this one. I can get 3-4 weeks out of this bar soap in a household where two people shower daily. The other osmia soaps last me 2 weeks if I am lucky, which is quite expensive.